Chelsea vs. Blackburn Rovers : 13 May 2012. After ten months of – cliché warning – highs and lows, the 2011-2012 season was approaching its inevitable conclusion. The game against relegated Rovers was always going to be a strange game and I drove over into Wiltshire to collect Young Jake and Old Parky with a mixture of happiness and sadness. Happy to be paying our respects to the team, at home, before the mammoth game in Bavaria. Sad to be travelling the well-worn path up to Chelsea Town for the last time for a few months. After opening with a flurry of songs by Stiff Little Fingers, we were soon hurtling east to the sounds of Chelsea fans Dave Gahan and Andy Fletcher. Another picture-perfect day. The sky was dotted with white clouds, the sun was out and the green fields of Wiltshire and then Berkshire were awakening from the dull months of winter. We spoke a little about the denouement of this crazy Premiership season. No question who I wanted to triumph. We sped past the Madejski Stadium at Reading, then Windsor – Ossie’s town – and then in to London. The Shard was visible way in the distance and the Wembley Arch to the north. The roads were strangely quiet. As I sped in past Fullers’ Brewery at Chiswick, it felt like I was taking part in a city-centre grand prix. The road ahead was completely clear of traffic. No mention of Beckington, Trowbridge, Melksham, Chippenham, Swindon, Reading, Slough, Brentford and Hammersmith, though. At 12.45pm, we were inside The Goose and the first person I bumped into was Mark Coden, who some of you know from previous U.S. tours. Unfortunately, he was still without a ticket for Munich, but was going regardless. I wished him well and then met up with a gaggle of mates out in the sunny beer garden. Unsurprisingly, the talk was virtually all devoted to Munich. 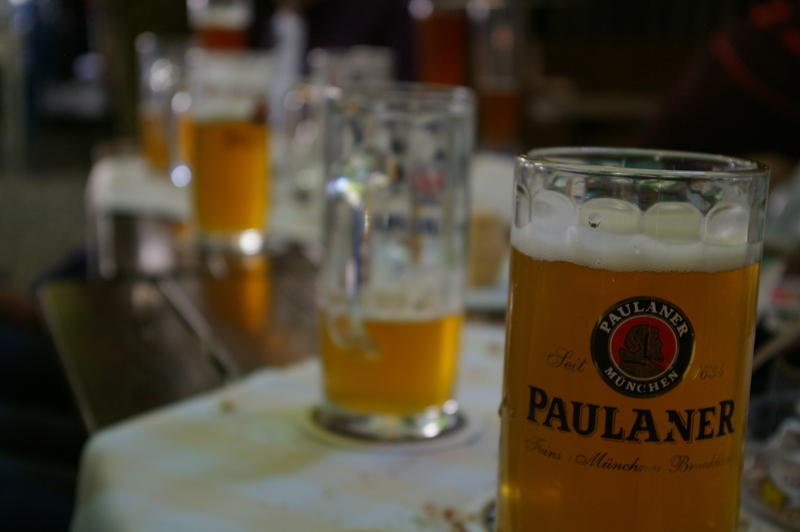 Most of the people I spoke to were Bavaria-bound and the sense of anticipation was tangible. Everyone wanted to know which route Glenn and I were taking. Everyone seemed to be going their own separate way. We all agreed that the next four days of work would be the longest four days of all time. We just wanted to get to Munich and let the party begin. There were a few comments backing up the widely held view that this had been the most unlikely of Chelsea seasons. I always remember two contrasting moments. Walking through Bristol airport in February on my return from Naples, we were 3-1 down and most likely heading out of Europe. At that same airport around two weeks ago, I had a bounce in my step as I covered the same ground. We were off to Munich in the Champions League Final. Staggering. Stupendous. Ridiculous. Magnificent. Bewildering. If I was an American, I would no doubt use just one. Conversations were abuzz all around me. Special mention for two friends; Milo 15 and Ed 22. The trip to Munich, with their fathers Simon and Daryl, will be their first ever away games in Europe. They know how lucky they are. They are great lads and it will be a pleasure to drink with them next Saturday. Our plan will be to assemble in a secret location – a beer hall – far away from the crowded city centre and then see how the mood takes us. We all agreed that we would rather spend four hours in the company of some friendly locals rather than three hours amongst the divs singing “Ten German Bombers” ad nauseum in the Marienplatz. Regretably, Parky isn’t going to Bavaria. This would be his last game of the season and he was celebrating it by throwing pint after pint of lager down his throat. Andy from Nuneaton is going to Munich with several others of his mates, but he is the only one with a ticket. I wonder how many Chelsea will be heading to Germany without a match ticket? Five thousand? Ten thousand? Maybe more? Breaking the protocol, Simon and I even spoke about Roberto’s possible team selection for the game in Munich. I ran through my personal thoughts. Hopefully, the twin central defenders Gary Cahill and David Luiz will be fit. If not, we will struggle against the crosses from the flanks aimed at Mario Gomez. I’d pick the speed of Bosingwa over the experience of Paolo. Fingers crossed on that one. Peter Cech, Jose Bosingwa, Gary Cahill, David Luiz, Ashley Cole. Holding, there are no other options apart from Jon Obi Mikel and Frank Lampard. Michael Essien is past his best – and it hurts for me to write this – and Oriel Romeu is too inexperienced. Then, the three attacking players. I’d go with the pace and honest endeavor of Salomon Kalou, the touch and guile of Juan Mata (our kingpin) and then the spirit and skill of Fernando Torres. I can see Kalou and Torres doubling back to thwart the threats of Ribery and Robben. I can’t see Florent Malouda or Daniel Sturridge putting in that same level of commitment, Champions League Final or not. If the centre-backs are doubts, one supposes that either of Bosingwa or Ferreira would have to shuffle in to the middle. On the walk down to the stadium, the streets seemed ridiculously quiet. In Vanston Place, we again met up with Scott and Andy from Trowbridge. There are five or six of them going to Munich from Trowbridge, but with no tickets between them. Further along Vanston place, a piece of classic Parky. On the pedestrianised cobble-stones, there are occasional bollards to stop vehicular access. Parky called out to Jake just as he was approaching a previously unseen bollard. Suffice to say, Jake will never be a father. On the approach into the stadium, there was still a lack of hustle and bustle. Where were the missing fans? Were they already inside The Bridge? I was puzzled. I made it to my seat just before the kick-off. My good mate Alan presented me with two tickets for Munich and it was fantastic – at last – to get my sweaty mitts on them. First thoughts about the new Chelsea kit were very favourable. Very smart. Very minimalist. Classy. It reminds me so much of the Umbro kit from 2005-2006. Memories of Crespo, of del Horno, of Maniche. Roberto’s selection was very interesting. Maybe I was getting ahead of myself, but I was intrigued that there were no players from “my” Munich XI playing against Blackburn. Was Roberto thinking the same as me? It was great to see Sam Hutchinson starting a game, of course, and I hoped that Romelu Lukaku would shine in a central location. Over in the far corner, there were more Blackburn fans that I had actually expected; maybe around 400. There was the predictable “Venky Scum Out” banner. The planned applause in honour of Didier Drogba’s (possible…probable?) last ever game at The Bridge on eleven minutes was pretty disappointing. It only really got going at around the 11 minutes 45 seconds mark. I had to explain it to the lads in front. To be honest, bearing in mind that we were only six days away from the joint second biggest game in 107 years, the atmosphere was surprisingly quiet. I spotted many empty seats all around the stadium. Even after the two well taken goals around the half-hour mark, the place remained docile. Maybe everyone was saving themselves for Munich. They were two nice goals. A great cross from Lukaku was headed in by John Terry. A strong dribble, away from the goal line – confusing us all – by Michael Essien resulted in the ball being tee’d up for Raul Meireles to toe-poke in. This was yet another goal that I was right in line of. Amongst these two goals, there was the usual exchange between Alan and myself, said in a broad Lancastrian burr, that “they will have to come at us now” and the usual “come on my little diamonds” response. Let’s hope we will be saying this in a German accent next Saturday. On the TV screen at The Shed End, the tickertape-style updates from other games seemed to be the centre of attention for us all. It seemed that all was quiet and calm at The Bridge, while there was a maelstrom of activity taking place all around us. I likened it to be in the eye of the storm, with other clubs and other issues whirring around in every direction. Blackburn Rovers were already relegated. We were guaranteed a sixth place finish. Two other games were dominating our thoughts – the ones involving the two Manchester teams. City 1-0 up. Good. This might mean QPR will get relegated. And so it continued. Every five minutes or so, our attention would drift up to the south-east corner as scores were updated. There was genuine shock and then sadness when the news came through that QPR had not only equalized at Eastlands but had miraculously gone 2-1 up. And with ten men. FFS. Poor old City. What a way to lose it. Always in their shadows. Remember when they won the league in 1968? On the following Wednesday, United won the European Cup. Always in their shadows. Would they ever recover from this? Down on the pitch, chances were at a premium, but we let Blackburn back in the game when JT was out jumped by Dann, before Yakuba stooped to get a finishing touch. Lukaku had been replaced by Didier Drogba, who was roundly applauded as he entered the fray. What a talisman he has been for us since his arrival from Marseille in 2004. Ramires then hit the bar with a delicate chip. In the last minute, Didier swung in a corner and Sturridge – as frustrating as ever – decided to chest rather than head the ball in from close range. To be honest, this was a mediocre performance, but nobody was too bothered. 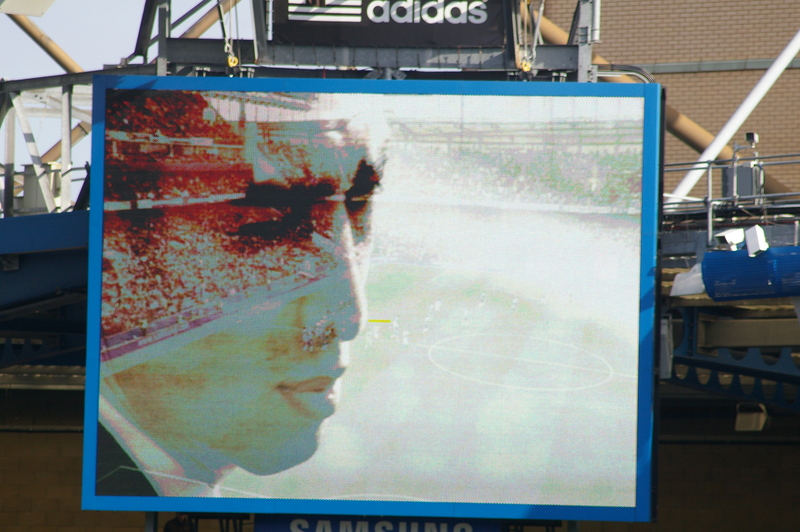 I noted with interest that both Torres and Drogba were on the pitch for the last segment. Was RDM thinking along the same lines as me for Munich? 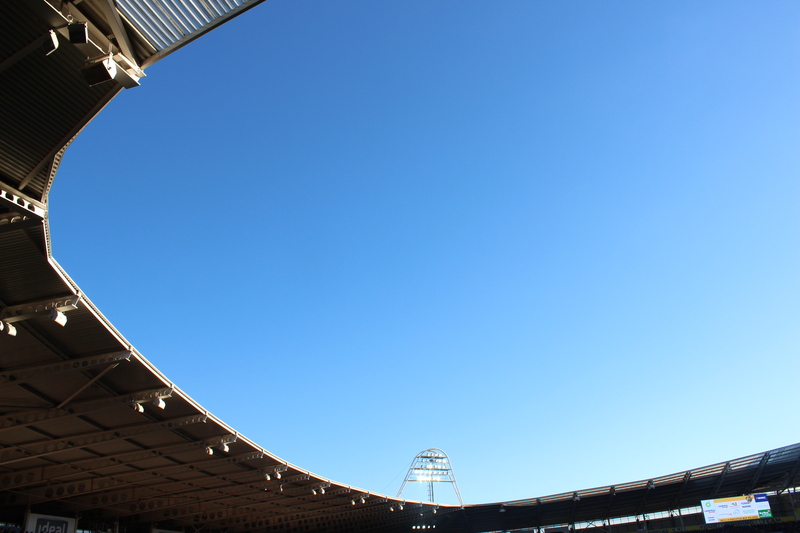 It seemed that every part of my being was focusing on the game at the Allianz Arena. So, the final whistle and the season had finished. Bolton were relegated; no more visits to The Reebok (2005 and all that) for a year or two perhaps. Wins for Arsenal and Spurs had provided them with top four finishes. Well, for Arsenal, anyway. Tottenham needs an asterisk next to it. I was gutted that United had pipped their neighbours to the title. In this amazing season, City had beaten United twice. Their players had lit up the season.They had surely deserved the title. Yet, typical City; just like them to mess up right at the end. The Chelsea players disappeared down the tunnel and I sensed an air of anti-climax. In preparation for a lengthy lap of honour by the playing staff, I disappeared out into the toilets. And then – a roar. Well, I erupted with a smile and raced back to see Alan and Jake. City may not be everyone’s cup of tea and I suppose we should be worried that their league title will entice further stars to join their “project” but I for one was very pleased. At last, City managed to trump United – and how. The news of the two injury time goals filtered through and I was transported straight away to Eastlands (hysteria) and the Stadium of Light (mysery), trying to even imagine what the supporters of those two bitter rivals would be experiencing. Give me the City fans and their self-deprecating wit and gallows humour over United’s glory-hunting legions of non-attendees any day of the week. It seemed that the majority of the Chelsea crowd was in agreement. There would have been no roar had United come from behind in such a manner to defeat City. Just a gnawing pain. I immediately relished the chance to witness the frame-by-frame coverage of the games in Manchester and Sunderland on “MOTD2” when I would reach home later that evening. But now, it was time for the Chelsea supporters to thank the Chelsea players and management team for their sterling efforts over the past three months. We all love these end-of-season laps of honour. A fair few fans, though, had decided to leave, but I was relieved that most stayed behind. I snapped away as the players and their children slowly strolled around the pitch. The wives and girlfriends watched on from in front of the players’ tunnel; designer handbags and huge Sophia Loren sunglasses to the fore. First, the triumphant boys with the F.A. Youth Cup, victors against Blackburn Rovers. Not their day, was it? Then, Neil Barnett introduced Roy Bentley to the crowd; now walking with a stick, but still a joy. After a hug from John Terry, he lapped up the applause cascading down from all four stands. One minute, he was using his walking stick as a conductor’s baton, the next as a snooker cue, the next as a golf club. What a character. Proper Chelsea. The first of the players’ children to raise a cheer were Georgie and Summer; JT’s twins raced towards the near goal and continually scored goals, pushing the balls past the line. Petr Cech’s son was next up and the look of determination on his face was fantastic. Over in the distance, Ramires Junior seemed to be dwarfed by the matchball. Frank’s children were more subdued. On the walk past, everyone was smiling, everyone was applauding the fans. Didier waved to someone in the West Stand and I wondered if it was Gill. Fernando posed with his children at The Shed End goalmouth, enabling the doting fans in the lower tier to take some photographs. I wonder if he knows that I have big plans for him in Munich? Rather embarrassingly, Neil Barnett suddenly appeared with the F.A. Cup and he hurriedly presented it to Roberto di Matteo. With the focus on next Saturday, had the club simply forgot to schedule the F.A. Cup as part of the day’s proceedings? The microphone was then thrust into John Terry’s hands and he thanked the fans with a few words. As with Wembley the previous weekend, I was one of the last to leave the stadium. We stopped for a refreshing drink in The Goose and then headed home. It was a glorious English evening, the sun slowly fading, the shadows lengthening and the music on the CD player stirring my senses. “Don’t turn this way, don’t turn that way. Straight down the middle until next Thursday. Reverse to the left, then back to the right. Twist and turn till you’ve got it right. I said my goodbyes – for the current season – to Parky and Jake. It has been a tumultuous ten months. We will need to raise ourselves for one last time, for one massive challenge, for one ultimate goal and for one final push. Just like Manchester United in 1968, we need to steal the thunder from Manchester City by winning the biggest prize of all. Chelsea vs. Stoke City : 10 March 2012. With two games in Birmingham behind us, the rambling story of our season returned to London. We have three games in nine days at Stamford Bridge. Three match tickets and an outlay of £136.50. Does anyone think I am complaining? No, of course not. I’m just happy to have a three-pronged attack for silverware as we head into the month of March. In some ways, the game against Napoli and their rampaging Three Tenors of Lavezzi, Cavani and Hamsik was on my mind more than the run-of-the-mill League game against the brutal threat of the Stoke City kickers and scufflers. Of course, our 2011-2012 season began with that difficult game at the Britannia Stadium on Sunday August 14th. In some ways, it seems only a matter of weeks ago. As Saturday March 10th 2012 unravelled before me, I acknowledged the truth in the the old adage about the football being an increasingly small part of the whole day out at Chelsea these days. I have my friend Bryan to thank for that. Bryan is 53 and a lorry driver from my home town of Frome in Somerset. He used to travel up with us for a few years a while back; I have a feeling that his first game with us was the 6-2 slaughter of Sunderland in 1997. He used to go to Chelsea in his younger years of course, but grew out of the habit. Anyway, from 1997 to 2002 or so, Frome was well represented at Stamford Bridge. There was Frank and Michelle, Glenn, Bryan and myself travelling up in one car and Dave, Karen and PD in another. Eight of us; a good show. In some respects, this was a bit of a golden age for us Frome followers. Not only were we rewarded with our first successes on the pitch since 1971, but most home games were usually followed up by us calling in at Ron Harris’ pub in nearby Warminster on the way home. They were superb times. Bryan stopped going regularly to Chelsea in around 2002 but has been back a few times since. Apart from a silly dalliance with Bristol City in his skinhead youth, much frowned-upon by Glenn and me, he has remained true to Chelsea, as his tattoos will testify. In November, I bumped into his partner Linda in town, but she had some shocking news. Bryan had returned from a job in Spain and had been very ill for a few weeks. He had a stomach ulcer, but further tests identified that he had contracted Legionnaire’s Disease. I called around to his house that morning and, without being melodramatic, Bryan explained to me that it was touch-and-go at one stage if he’d pull through. Thankfully, his spell in hospital enabled him to recover and he was back at work before Christmas. Bryan hadn’t been to Chelsea for a couple of years and so I was really looking forward to getting him back in The Goose amongst old friends. When I called for him at 8.30am, he was already out on the grass verge, awaiting my arrival. He looked so keen that I imagined that he had been doing press-ups on the lawn in an attempt to dissipate an overflowing and enthusiastic supply of energy which had been welling up. Linda waved us off and we were on our way. I soon collected Parky at 9am and we were London-bound. Bryan had met Lynda in the Falkland Islands. Parky had served in the Falklands Conflict of 1982. As we zipped past Swindon, the chat centred on those islands in the South Atlantic. Bryan and Parky certainly had lots to talk about. With the thirtieth anniversary of the Falklands approaching, we spoke about the past…Port Stanley, Goose Green, HMS Sheffield, the General Belgrano…memories of 1982. We spoke about the present; the noises coming out of Argentina at the moment. We spoke about the recent deaths of the six British soldiers killed in Kandahar Province in Afghanistan. I am currently getting the house redecorated (the Chelsea room, specifically) and I was horrified to hear on Thursday that the son of my decorator Steve was in the tank behind the one which was hit. Thankfully, and mercifully, he escaped the immediate attack, though how that young man is coping the aftermath of losing some of his comrades can only be imagined. I told Bryan and Parky that the club had quickly agreed to a minute’s silence before the day’s game as a mark of remembrance for those six brave soldiers who had been stationed in nearby Warminster but who had lost their lives on a foreign field, thousands of miles away from their homeland. At 11.15am, the three of us were tucking into a Saturday Fry-Up and at 11.45am, we were in The Goose amongst friends. The weather was pretty mild and the beer garden was being used in earnest for the first time since the late autumn. While Bryan chatted to Daryl, Rob and Alan, I had a good old natter with Neil and The Youth. Unsurprisingly, our conversation centred on the recent sacking of Andre Villas-Boas, but also the recent rumblings from the club and the Hammersmith & Fulham Council about the possible development of Stamford Bridge. Of my eight to ten match going mates, my closest mates, the inner sanctum, I think most are of the same opinion. Chopper from New York suddenly appeared and he was full of smiles, loving the London life and relishing the Napoli game on Wednesday. Jesus flitted past; happy to have seen us win in Birmingham during the week. While I was getting a round in, who should I see but Dave and Karen, from Frome. Dave has been on a diet and has lost a massive five stones; fair play to him. Of course, this just meant that he was the instant target of tons of Micky-taking and light-hearted abuse. Photographs of all of us. Tons of smiles. This is the life. Alan passed over my away tickets for Manchester City, Fulham and Aston Villa; another £142. Phew. On the TV, the Bolton vs. QPR game was garnering scant attention. My views on goal-line technology are softening with every mistake made by an official, but my fear, as always, has been that this will be the thin end of the wedge. Before we know it, there will be video replays being used for off-sides and then fouls and handballs. Referees will be undermined further and the lunatics will have taken over the asylum. At Chelsea, however, this happened years ago. We taped the banner up – it’s a little tattered these days, having travelled with me from America to Malaysia – and drew the usual stupefied looks from the nearby Chelsea fans. I always have to explain what it means. Over in the far corner, the Stoke contingent looked pretty pathetic, duck. Alan joked that it looked like only their notorious “Naughty Forty” – plus a few others – had bothered to travel. The teams appeared and then gathered on the centre circle. Neil Barnett mentioned that this was our 107th birthday and was our Founder’s Day. He also drew attention to the scarlet-tunics of the seven Chelsea Pensioners who had been given prime seats in the Directors Box in the West stand. Neil then said a few sullen words detailing the six soldiers who had given the ultimate sacrifice during the past few days. Rather than reverential silence, though, there was applause. I’m not so sure I agree with this. I see no problems in applause when one is acknowledging, and celebrating, the life of someone who has lived to the allotted “three score years and ten” – or hopefully more. But I do not feel that applause should be used when we mark the loss of lives so young. We don’t applaud on Remembrance Sunday in November do we? Applauding a life is a relatively new phenomenon in the UK – the Italians have been doing it for years – and the first time that I can remember it being used at a Chelsea game was at Fratton Park in 2005 when the crowd began in silence, but soon started applauding the life of George Best, that famous former Chelsea native, who had recently lost his battle with alcoholism. Another full house. The sun was out. No need for my jacket; a polo shirt was enough. In the end, Stoke had around 350. There was an additional “Remembrance” banner on display in The Shed; Peter Osgood had momentarily been displaced a few yards. The atmosphere was typically tepid. The game. Do I have to? I wondered if Ramires would be stationed out wide in a forward three with Drogba and Kalou, ahead of the midfield of Mikel, Meireles and Lampard. We attacked the MH during the first-half and it felt odd. We don’t often do this, do we? Early chances came to us. Branislav Ivanovic headed over from a corner and then Gary Cahill had a strong run, followed by a belter which was saved. Bryan, the truck driver, unveiled his iPhone and this was met with some typically derogatory comments from Alan. I wondered if it had any aps which helped Bryan locate the nearest HP Sauce bottle when he was in a greasy spoon café. Stoke rarely troubled us to be honest. A slip by Terry allowed Walters in, but his effort was blocked by the covering Cahill. Their limited game plan was affected when Ricardo Fuller was given his marching orders for a stupid stamp on the prostrate Ivanovic. To be honest, my eyes were elsewhere and didn’t see the offence. Just after the half hour, there was typical rough and tumble at a corner and John Terry appeared to be manhandled as he tried to gain a square inch of space. Despite these close attentions, JT’s down and up header rattled the bar. A few Chelsea half-chances came and went. The manager decided, after a while, to withdraw Meireles and bring on Mata. It was clear that Stoke would do their dogged best to hang on for a draw. Just before the break, that man Ivanovic struck a thunderous angled drive which rocked the bar. Lampard hit a daisy-cutter which Begovic easily gathered. We had heard that Bobby Tambling would be on the pitch at half-time. Neil introduced us to a young lad from Cork, who was attending his first game at Stamford Bridge. Bobby Tambling, with his wife Val alongside, was introduced to lovely applause and was able to say a few, halting, words to thank us for all the best wishes he has received during his recent period of ill health. I was able to capture this on film. On more than one occasion he referred to his “blue family.” It was a touching moment. There was a lazy start to the second-half really. David Luiz came on to take over in the right-back berth from Ivanovic. It took a full 15 minutes for us to threaten Begovic’ goal when JT took the ball from deep and let fly with a shot which whipped past the post. We still await JT’s first blooter from outside the box. Maybe he is saving it for a special occasion. The Stoke fans were quiet and we were no better. On 65 minutes, Frank was hauled down when apparently through on goal, but Didier’s fine free-kick was palmed away for a corner. Soon after, a moment of pure class. The ball was played in from Cole into a central position. Mata delicately played the ball through to the unmarked Drogba, who side-stepped the goalkeeper and slotted home. I immediately thought that this was just the sort of ball that Torres has been begging for the past year. The crowd roared and the players danced down to the South-West corner. A lob from Wilkinson evaded Cech and had us all worried, but thankfully was wide of the target. A mistake by JT then allowed Jerome in on goal, but his shot was wide after a strong run. Daniel Sturridge, the last substitute, had a chance after a jink inside. Mata struck the woodwork from a free-kick. One last chance for Sturridge, but again wide. It was hardly a game to remember. 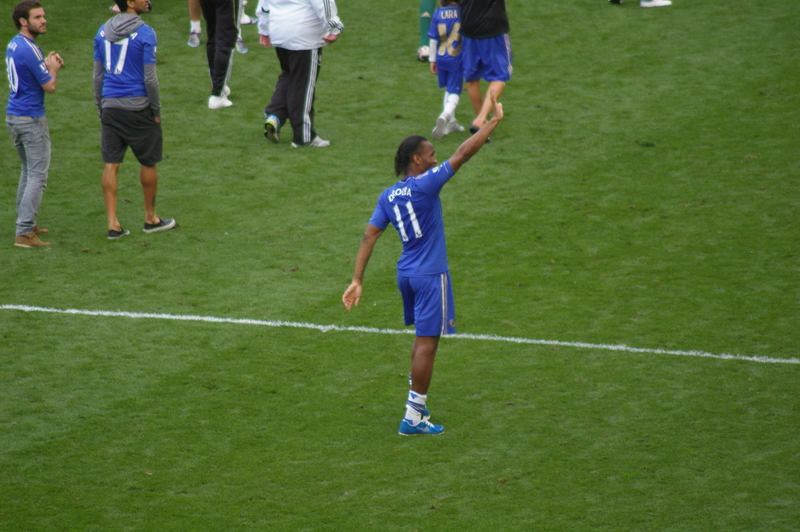 At the final whistle, Neil Barnett commented that Didier became the leading African scorer in English football. I watched as Didier advanced towards the Chelsea supporters and gave his shirt to a lucky fan in the MHL. I made good time on the drive home. We listened in as Tottenham lost at Everton. It was the usual end to a Chelsea Saturday with a time-honoured viewing of “Match of the Day”, the national institution. All I can add about the programme is that Liverpool’s 1-0 loss at Sunderland was featured a few games after ours. This was a morsel of comfort for me; in years gone by, any Liverpool loss would be seen as major news. These days, such defeats warrant hardly a flicker of interest by the media. We reconvene on Wednesday for the visit of the crazy Neapolitans. It could be an absolute cracker. Blackpool vs. Chelsea : 7 March 2011. At last, one of the most eagerly awaited domestic away games was upon us. Chelsea last visited Bloomfield Road for a League Cup game in 1996, but our last league game in that famous resort town was in the mid-‘seventies. A return visit was long-overdue. Ever since The Tangerines gained promotion last May, this away fixture has really caught the imagination of the Chelsea faithful. Why is this? Well, the usual case of “new ground” tells only half the story. Blackpool has been a monster on the holiday map of the UK since cheap railway excursions brought thousands of people in to the town during the Victorian era. It remains England’s most famous resort, much favoured by Northerners and Scots – to say nothing of stag and hen parties. The town has a reputation as a bold and brash – and cheap and cheerful – resort with its famous Golden Mile, sandy beaches, Tower, Pleasure Beach, trams, concert halls, three piers and autumnal illuminations. If you throw in a few casinos and lap-dancing establishments, for some, Blackpool by the sea equates to our Las Vegas. Stop sniggering at the back. Of course, we just knew that we wouldn’t get Blackpool away on a late summer or spring weekend, but it came as a kick in the teeth when our game at Bloomfield Road was rescheduled for a Monday night. However, there was no doubt that Chelsea would be in Blackpool in good numbers and some went up on the Friday, Saturday and Sunday. For some, it would have the feel of a European away game. As I drove the 15 miles to collect Parky, I was filled with a feeling of chilled-out pleasure, the whole day ahead of me, a trip in support of my team – and no worry of work on the Tuesday as I had booked the whole week off. Of course, our recent resurgence, plus a lovely Sunday which saw both Manchester United and Tottenham drop points, only added to the sense of anticipation. I collected a smiling Lord Parky at 11am and we were on our way north. Parky’s last visit to Blackpool was way back in 1988, that second summer of love when the dance halls of England were reverberating to acid house for the first time. As we ploughed north, I spoke of my previous visits to Blackpool. In the immediate post WWII period, my mother became friendly with a Lancashire girl, Muriel,when she spent a week near Rye in Sussex. They were two of the many “land girls” who were gainfully employed by the government to bridge the gap in the agricultural workforce caused by the missing thousands still stationed abroad after the conflict. Muriel was from Burnley and, after marrying Joe, went on to run a bed and breakfast hotel in Blackpool on the bracing Lancashire coast. Mum and Muriel remained friends and so, on a couple of occasions in the late ‘sixties, my parents and I stayed with them at their B&B. This would have been a massive car trip for Dad, in pre motorway days, and I have vague memories of the journey north. The approach into Blackpool, with Dad asking if I can spot the tower, must have been as exciting as it gets for a three year old. There is grainy cine film of myself cavorting on Blackpool beach, wearing a bizarre swimming costume, and playing with my father, trousers rolled up in classic English paddling mode, as the tide gently lapped at the golden sands. There is also film of me riding a famous Blackpool donkey and on a ride at the famous Pleasure Beach. Of all my childhood memories, the time spent at Blackpool with my parents are some of my sweetest. At the age of three, I doubt if my fascination with football had begun, but I do remember very well the moment that Joe had pointed out the stands and floodlights of Bloomfield Road, at the end of a typical terraced street. I can therefore, without much fear of contradiction, say that the home of Blackpool F.C. was my first ever sighting of a football ground. Blackpool stayed off the radar for more than three decades, with holiday destinations getting more and more exotic with each passing year. By the time that I next visited Blackpool, in 2001, there had been achange to my holiday destinations; more and more were becoming football, er Chelsea, based. Trips to Barcelona and Bratislava had replaced trips to Blackpool and Bournemouth. In fact, my last European beach holiday was to Corfu, way back in 1992. 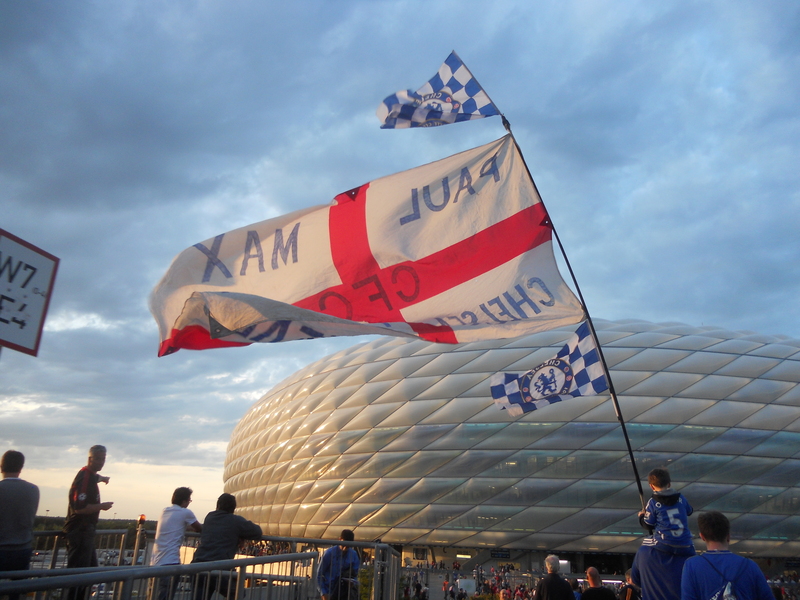 Since then, virtually all European holidays have been with Chelsea. Give me the buzz of a football city rather than a hot beach any day. In the 2001 to 2003 period, Chelsea’s European trips almost dried up. Neither myself nor many of my mates travelled abroad in these “UEFA cup years,” and so to keep our team bonding intact, we instead supplemented our week-to-week meet-ups with three end-of-season trips to Blackpool (2001 – Manchester City away), Scarborough (2002 – Middlesbrough away) and Brighton(2003 – Liverpool at home). Seven of us (Alan, Glenn, Russ, Daryl, Neil, The Youth and I) had a lovely time in Blackpool in 2001. It certainly helped that our mini-bus excursion to Maine Road resulted in an easy2-0 Chelsea win against a poor City team. This was our last ever game at City’s old home ground, but the memory was scarred by an angry pitch invasion from the City lads just before the final whistle. I took a few photos of these stereotypical Mancs, all Gallagher-esque posing and designer jackets, eyeballing us all in the away stand. For once, we didn’t retaliate. With a line of Manchester police to protect us, we just stood and stared them out. Our mini-bus was parked in the grim streets just outside the away end and we had a quick getaway. We would never return to that famous old stadium. This also proved to be the last ever Chelsea game for Frank Leboeuf and Dennis Wise. Back in Blackpool that evening, after a quick change from match-going jumpers, jackets, jeans and trainers to smarter attire, we had a legendary pub crawl deep into the night. Almost ten years have since passed. Where does the time go? I suppose the smart-arse answer to that is “the time goes winning trophies.” Is it any wonder that the time has flown by? Three league titles, three F.A. Cups and two League Cups. Thank you very much and more of the same please. Judy and I paid a quick visit to Blackpool, mainly to see the famous illuminations, after the Wigan game in the autumn of 2009. I was reminded of how brash the town was, but never expected to be soon returning with Chelsea. However, that’s it for me – just two visits to Blackpool in around 43 years. For once, the trail north – M4, M5, M6 – seemed to be clear of heavy traffic and I made good time. The Smiths were followed by Everything But The Girl and then The Killers. On the final approach to Blackpool, with blue skies overhead, we spotted the famous tower and then drove straight past Bloomfield Road before parking in the town centre. Most of the locals seemed to be wearing scabby tracky-bottoms – they must be getting their fashion advice from the nearby Scousers – and I had the feeling that the town had nosedived further since 2009. At a few minutes past 3pm, we had joined Alan, Daryl, Neil and Gary in The Walkabout. They had travelled up on Sunday morning. Daryl explained that the highlight of the previous day had been the sight of big Tommy Murphy, one of Lovejoy’s mates, taking to the floor during a Northern Soul segment at a local bar. The image is still burning in my mind; wish I had been there to see that! I had a good chat with Neil, who has experience of travel in Asia, ahead of my trip out to Malaysia and Thailand with Chelsea in July. We were then joined by Mike and Danny from New York amidst talk of Eric Cantona and the New York Cosmos, Danny’s scrape with Newcastle United hoolies in the early ‘eighties and the Coney Island like charms of Blackpool. We dipped into another pub on the short walk down to the ground and bumped into a few more Chelsea mates. General consensus was of a heavy Chelsea victory – maybe by four goals to nil. Blackpool, to be honest, had the feel of a ghost town at this stage. We had hardly seen any home fans in and around the town centre and I guess their fans had been busy at work. Bloomfield Road has been slowly redeveloped over the years and the large Kop to the north of the stadium was taken down quite a few years ago. It is now a trim, but pretty bland, single tiered stadium, albeit with a thin line of executive boxes under the roofs of the west and south stands. The east stand, hastily erected during the summer, is a temporary structure and this was where the 1,600 away fans were assembling. I took a few photos of Ashley Cole, Fernando Torres, John Terry, David Luiz – the new hero – and Frank Lampard as they finished their pre-match routines. I had a good seat in row K. The temporary seats were surprisingly padded but everyone stood. The beery Chelsea fans were in good voice and the tight away stand was rocking. Big Pete, one of the CSG stalwarts, was standing a few rows behind and his 6 foot 6 inch frame was augmented by a massive David Luiz wig. He looked a picture, though he probably blocked the view of the poor people in the rows behind. Alan, Gary and I were again sat near Mark, Nick, Robbie and Charlie – familiar fixtures at away games. It made me realise that all of the staunchest of Chelsea supporters were in Blackpool; we had all made the effort, paid the hotels, paid the train tickets, paid for the petrol, taken time off work, made the effort. May it long continue. Drogba in for Anelka, Bosingwa in for Ivanovic, Zhirkov in for Malouda. Game on. The new David Luiz song – “You brighten up my life, I’ll let you shag my wife, I want curly hair too” – was soon aired, but Blackpool began the stronger team. A bursting run from The Captain found Didier, but his attempt was smothered by Kingson. Andy Reid, the rounded Blackpool winger who reminds me so much of former Forest player John Robertson, was enjoying lots of space in the midfield and there was growing concern that our midfield was again sluggish. Blackpool, full of energy and team work, certainly dominated the first twenty minutes. Print that on your T-shirts! Then, a Frank Lampard corner away to my right and my camera focussed on the run by Luiz towards the near post. I almost missed the subsequent unhindered leap by John Terry, but saw the ball bounce down and into the Blackpool goal. Phew. The applause was surprisingly reserved – not sure why. The songs continued and we clawed our way back into the game. 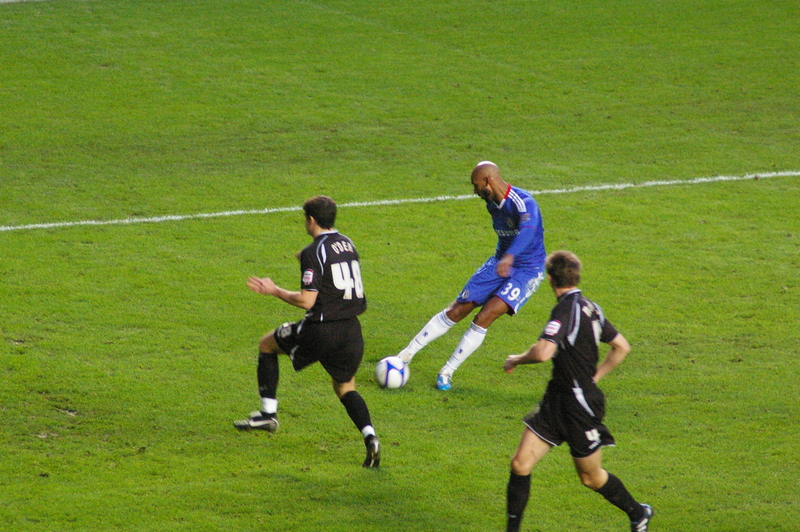 A rising drive from the left foot of Jose Bosingwa was ably palmed over by Kingson. However, Blackpool was still giving as good as they got. Stephen Crainey, the left-back, was augmenting Reid’s forays into our defence with several timely runs. Jason Puncheon waltzed past Luis and struck a low shot, which PetrCech fingered onto his near post. This was a near miss and further galvanized the home support. Just on half-time, however, the best move of the match which involved four of five players in a flowing passage resulted in a left-footed shot from Ramires which was turned around the post. Despite a slim lead, we knew we had rode our luck. At the break, there was general disquiet amongst the Chelsea faithful. Our twin strikers were not really working together and the midfield were not playing as a unit. This was another substandard show from Messrs’ Lampard and Essien. Ramires was again the star of our midfield four. Chances were exchanged as the match progressed, but it was not until Salomon Kalou entered the fray on the hour that we began to look livelier. Drogba, suffering with one or two knocks, had been hobbling around for a few minutes and we all expected Anelka to get the nod. Instead, Kalou breathed new urgency into the team. Firstly, he won the penalty with a strong run deep into the box. Frank calmly despatched the penalty and we were two to the good. This goal was celebrated with the releasing of a purple-blue flare towards the back of the Chelsea contingent. The smoke drifted across the pitch, but soon dissipated. This was followed up with a stand-shaking bouncy. Good times. That man Kalou then delightfully played in Frank, and our number eight ably converted with the minimum of fuss. As he reeled away, I was reminded that both of our goal scorers, JT and Frank, were tied at 471 in total Chelsea games. These two stalwarts, our true Blue Brothers, have been at the very epi-centre of our successes since 2001 and we would be supporting a very different Chelsea Football Club without them. They embody our spirit and character. Although Frank has not been himself this season, he always chimes in with key goals and JT is JT. He was one of our best players yet again. Fernando Torres was pretty quiet all game and his best chance was a nonchalant flick with the outside of his right foot which did not threaten the Blackpool goal. His goals will come. Young Josh – “he’s only thirteen,” the away fans bellowed – entered the game and enjoyed some nice touches. With Malouda’s fresh legs exposing tiredness in Blackpool’s defence, we fully expected a couple more goals for The Champions, but it was Blackpool who enjoyed the last goal of the game, a low drive from Puncheon leaving Cech stranded. To be honest, we went to sleep in the last few minutes and the Blackpool support was encouraging their team on. A few chances flew past Cech’s goal, but we shakily survived. The other lads were headed back into the town, but Parky and I soon found our way back to my waiting car. We rolled out of town at 10.30pm and Chelsea had three much needed points tucked inside our back pockets. It hadn’t been a great performance, but – oh boy, I’m sure everyone has worked out the mathematics – those three points gained on a blustery night on the Lancashire coast could be vitally important come May. After a coffee stop on the outskirts of Stoke and with music from The Stranglers and then Echo And TheBunnymen keeping me going, I eventually reached home at just after 3am. We reconvene in nine days’ time for the visit of Copenhagen to Stamford Bridge. Chelsea vs. Ipswich Town : 9 January 2011. What a beautiful sunny Sunday morning. As I left the house, the sky was completely devoid of clouds and there was a lovely bite to the winter air. However, on the 30 minute drive to collect His Lordship from Parky Towers, my car was sliding on black ice. It was the worst I had ever known to be honest.I soon heard on the radio that there had been many accidents overnight and in the first few hours of Sunday morning. My other route up to The Smoke, the A303, was closed in Hampshire due to a smash. Not to worry, once I got onto the A350 and the M4, the dodgy road conditions were behind me. On the Saturday evening, we had both attended a 50th birthday party for Andy, a Chelsea fan from Trowbridge, who I first met in 1984. He is mentioned, in fact, in my little segment in Mark Worrall’s “Chelsea Here Chelsea There” book. 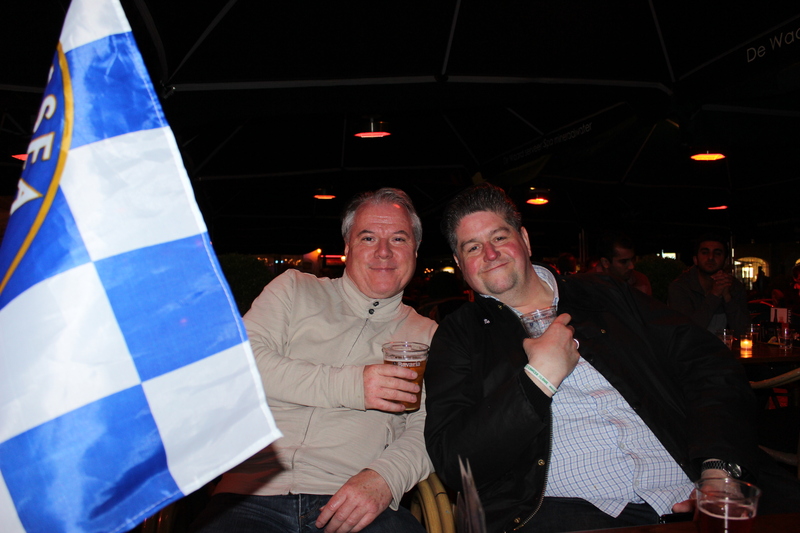 It was a great night and a few Chelsea fans “of a certain age” were in attendance from the surrounding towns…I was flying the flag for Frome, Mark from Westbury was there, plus Les from Melksham, to say nothing of Steve, Ashley, Mick, Shep, Parky, Andy and Ally from Trowbridge. It made me think about my youth as a Chelsea fan in the Somerset and Wiltshire area. Certainly in Frome, there weren’t so many Chelsea fans around. The chosen few certainly stuck together…and once our travels to games broadened our experiences, the other local lads soon became friends. I think this is different to the fans – say, in Frome – of the big two teams of Liverpool and Manchester United. Of a school year of 200 boys, there were probably 20 United fans and I am guessing that, because United fans were so widespread, I bet there was no special bond. Why would there be? Chelsea fans however – rare in Frome, for example – clung together desperately. It was a case of strength in numbers. For example, at Frome College in 1981, there were no Chelsea fans in the sixth form, I was the only Chelsea fan in my year and there were four Chelsea fans in the two years below me. So, only five Chelsea fans in a school of 1,300 kids (there were no Chelsea female fans of course, which goes without saying…it was the ‘eighties.) And we knew who we were alright…Chris, Dale, Richie, Troy and Glenn. The Famous Five. I saw Troy at our game at Ashton Gate in 1976, I saw Dale at games in the ‘eighties, I sit next to Glenn at games to this day but I think Richie didn’t use to go to Chelsea. But we knew of each other alright. I think fans of “lesser” teams always have that bond. With our appeal so much bigger today, I really wonder if that relationship is there for the youngsters in the Frome area. I personally doubt it. However, for us lot – plus PD, Dave and a few more – we’ll always stick together. 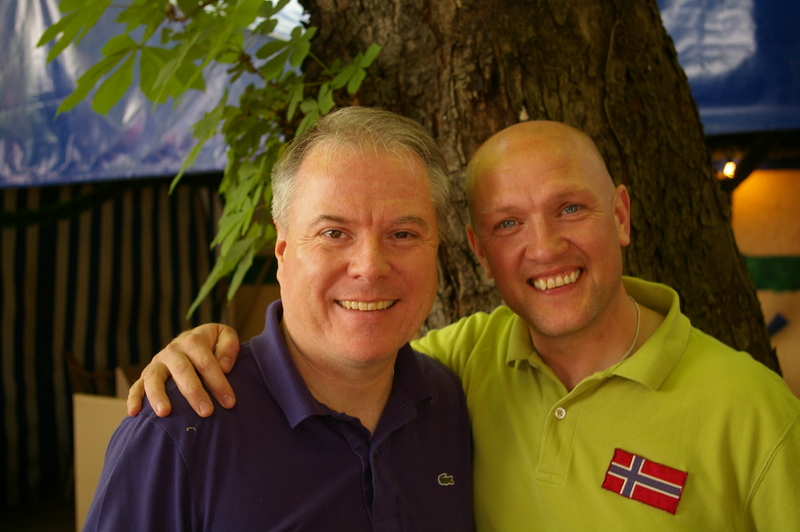 I think that barren spell in the ‘eighties helped to forge this special friendship and long may it continue. For the entire length of the journey to London, the sky remained clear and cloudless. I had a quick breakfast and then joined the boys in The Goose at 12.45pm. There was a good turnout for this F.A. Cup game with Ipswich Town. A few of the lads had their children in tow, lured by the cheap ticket prices. It was £25 for an adult for starters. Surprisingly, my home area was only represented by Parky and myself, but the Midlands was represented by Burger, Andy (plus 2 children), Jokka, Neil, Chopper (plus wife and 2 kids), the Home Counties by Daryl, Simon (plus 1 child), Rob, Russ and Gary and finally The Channel Islands by Chris ( plus 1 child). Towards the end, I met up with four from the North – Phil (plus 1 child) and Malcolm (plus 1 child), lads I see rarely these days, but acquaintances from a while back. So – 24 all told. Guernsey Chris informed me that his son’s first game was against Ipswich in 2001 and he is yet to see us lose. That just goes to show how successful we have been in that period, eh? The United versus Liverpool game was on TV, but not many were paying too much attention – why would we? I mentioned to Gary that I would be soon approaching my seventh anniversary of consecutive Chelsea home games – the first game in this run was on January 18th. 2004 – but Gary puts me to shame. He has missed just one Chelsea first team home game since 1975. To be honest, there should be an asterisk on my run because I missed the first team friendly against Celtic in August 2006, but I’m not counting that (though, if I am honest, I ought to…) Now I have put all of my Chelsea games on a massive spread sheet, expect more and more of these little statistical nuggets over the season. You have been warned. I’ve mentioned before that the F.A. Cup does not seem to have the allure of times past; despite which ever TV channel has coverage of the games informing us otherwise. Thirty years ago, F.A. Cup games would warrant an extra 25% on the gate, but these days, it seems that the Cup attracts 33% less. Except at Chelsea, where we play to sell out gates at virtually all games, much to my pleasure. However, this is no doubt due to the cheaper tickets at domestic cup matches…one of the best innovations of recent seasons at Chelsea. With perfect timing, I reached my seat just as “The Liquidator” was rousing the support – after each musical break, “CHELSEA” was lustily bellowed by all and sundry. This was a good sign. I had hoped that our fans would rally behind the team, putting recent past performances to one side. The team was a pleasing mixture of old and new. Cech in goal, Boso at right back, JT and Brana in the middle and the promising Van Aanholt on the left, a midfield of Frank, the improving Ramires and young Josh, with Kalo, Anelka and Sturridge in attack. No complaints there. Ipswich had 3,000 away fans but no flags. The game began and we peppered the Ipswich Town goal in the first fifteen minutes, but Daniel Sturridge in particular was guilty of carelessness in front of goal. We were playing some nice stuff, with a couple of flowing moves and there was a good vibe inside The Bridge. However, Ipswich threatened us on 16 minutes with a quick break down our right. 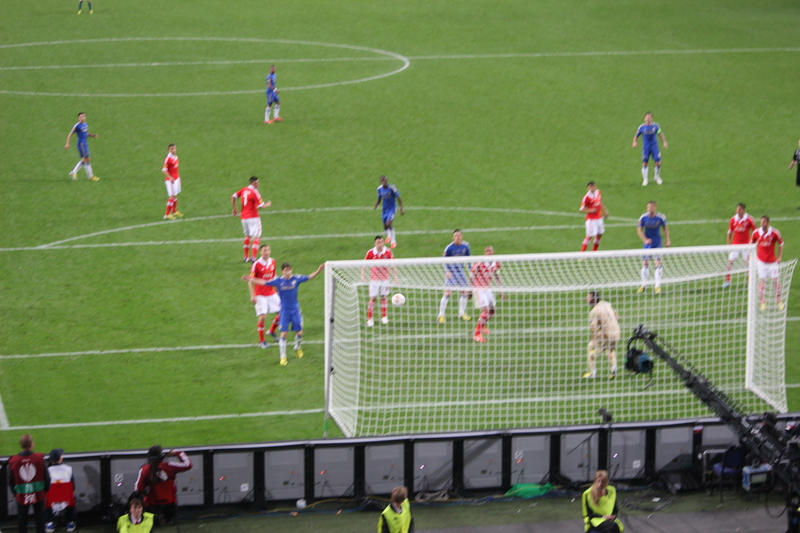 The resultant shot was blocked, but Petr Cech appeared to wind himself in the process. He lay prone for a while, but then rose to a loud roar. On 22 minutes, a lovely move found Studge but he decided to leave it for Anelka who took one more touch than was necessary and his low shot was cleared off the line. I held my head in my hands. Soon after, we got behind them and pulled the ball back for Frank in a Prime Time Position. Frank slammed the ball over. Oh hell – don’t say it’s going to be one of those games! More efforts went the same way – shots from McEachren and then Anelka flew over the Ipswich goal. Then, at last, a shot from Anelka and a scramble inside the six-yard box and Kalou prodded the ball over – he doesn’t miss from there! Immediately after, a lovely early ball – fast and low, just like the doctor ordered – into the six yard box from Jose Bosingwa was adroitly flicked in by Sturridge. Get in you beauty. That goal had the entire crowd on its feet. More was to follow – on 38 minutes, a bad tackle on JT and from the Lampard free-kick, the ball was flicked by an Ipswich Town defender into his goal and we were 3-0 to the good. Phew – things were going well. The only downer was the relatively tough away draw in Round Four – yet another cup tie against Everton. Why does Chelsea always seem to draw the same teams in all cup competitions? How many more bloody times do we have to play Everton, Liverpool, Ipswich, Watford, Barcelona, Valencia and Porto? I was longing for an away game at Torquay, Orient, Burton Albion, Brighton…or Leeds United. The bloke next to Alan looked a source of much amusement. As is the way with a lot of our supporters these days, he was silent for all of the first-half…throughout the game, he was listening to a radio via a set of little earphones and of course Alan and I suggested a comic reason for this. You know how we operate by now, eh? I suggested that rather than listen to the roar of the crowd and be involved, he was listening intently to the shipping forecast (probably the most boring piece of radio, ever). That then gave Alan and me the chance to air some truly horrendous puns about the various shipping areas, and out of respect to you all, I won’t repeat any of them. Ex-Chelsea and Ipswich Town striker Kevin Wilson (Willo) was on the pitch with Neil Barnett at the break. Rather than sit on our laurels, we kept going after the break and we were soon rewarded with a magnificent goal from Nicolas Anelka. After a quick interchange, he struck a lovely low shot from an angle which entered the goal just inside the far post. A superb goal. Three minutes later, the rarest of things – not only a Daniel Sturridge shot with his right foot, but a Daniel Sturridge goal with his right foot. From a Lampard pass, a delightful curler flew into the goal and the crowd erupted again. Despite no Ray Wilkins being alongside to translate, Carlo sheepishly acknowledged the fans. Then, a period of lovely confident football…McEachren caressing the ball and prompting others, Lampard strong in the tackle and intelligent with his passing, Anelka devilish – the Anelka of old – and Ramires continuing to impress. Over the past five games, I would suggest that John Terry and Ramires have been our most consistent performers. After the close bunching of our goals, two more ensued within a minute…two Frank Lampard strikes (the first from the edge of the box, the second from two yards out) and the place was bouncing. Frank – admittedly against a lower class of opposition – appeared to be approaching his old form and looked a lot more at ease than at Wolves on Wednesday. This is marvellous news. To be quite honest, we could have scored a few more, make no mistakes. I remember Gael Kakuta blazing over towards the end. Shipping Forecast Man decided to leave, not surprisingly I suppose, with five minutes of the game left. I guess he had endured far too much excitement for one day. The seventh time we have scored six goals or more in a game in the last twelve months. It was just good to be back on track, despite the poor quality of the opposition. A win is a win is a win. I met up with Parky on the Fulham Road and he was rather bemused. Why? He had slapped £3 on us to win 6-0! He had missed out on £100. A typical drive home – Fruit Pastilles, a Krispy Kreme doughnut and a Red Bull at Heston Services to give me enough sugar and caffeine to get home safe, then some anthems from my youth – Scritti Politti, Japan, China Crisis, Talking Heads, Kraftwork and Ultravox…and Parky asleep – no doubt trying his very best to erase the memory of Frank’s last goal.